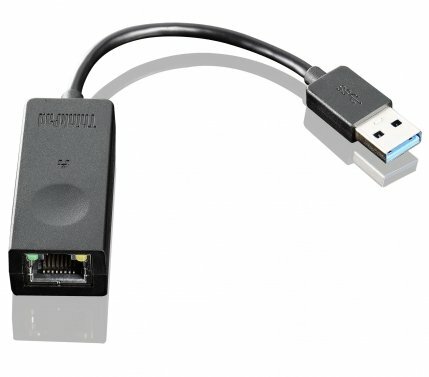 The ThinkPad USB 3.0 Ethernet Adapter from Lenovo enables Ethernet on systems which do not have an Ethernet RJ-45 connector through a USB port on the system. Its USB 3.0 Ethernet adapter provides optimal speed Gigabit Ethernet solution via a USB 3.0 port and enables booting over the LAN on selected ThinkPad systems. The adapter lets you connect your Ultrabook or Tablet to your corporate VPN at the office or go online in your hotel while you are travelling. Its small form factor allows a convenient fit into any computer case or travel bag, so you can take it with you anywhere. Additionally, it features a full-size RJ-45 connector, LEDs on the connector to indicate connection status, two LEDs on the RJ-45 port to indicate power and data transfer. 4X90E51405 Lenovo Genuine Retail Factory Sealed ThinkPad USB 3.0 Ethernet Adapter. Features Lenovo Full size RJ45 connector, LEDs on connector to indicate connection status Two LEDs on RJ45 port for power and data transfer indication. Green for power and Yellow for activity. Booting from LAN and loading image from remote server both on legacy BIOS and UEFI BIOS system QoS (Quality of Service) tagged packets and duplicate address detection. Does Not support POE(Power over Ethernet) Giga bit speed when running on USB3.0 environment 100M/10M adapt when running on USB2.0 environment . Ethernet receptacle (L x W x H) 53 mm x 15 mm x 16 mm, Cable (L x D) 80 mm x 3.5 mm , Approximate height 3cm, Approximate width 5cm, Approximate length 18cm.